The South African Hajj & Umrah Council is pleased to announce that we have got a new Facebook Page, SAHUC Hajj. We have reached the maximum “Friend” capacity on our old account and have now launched our new Professional Business Page. 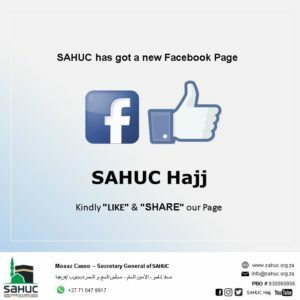 To all our current and new followers, kindly “Like” and “SHARE” our new SAHUC Hajj page to continue receiving information.